Rev Doug Michael was born in Cape Town, South Africa, during the height of apartheid in that country. His medical studies after high school brought him to the clinics and hospitals serving the front-line casualties of the violent inter-tribal and inter-racial struggles marking apartheid’s end. Those experiences, nurtured by his deepening faith, led him on a new journey: to serve those sick in heart and mind, rather than body. Rev Michael was ordained in 1999 and became especially involved in the reconciliation work with which the Anglican Church – guided by Bishop Desmond Tutu – was engaged. He served fifteen years in South Africa, including seven years as Archdeacon of Johannesburg, before relocating to Canada at the end of 2013. 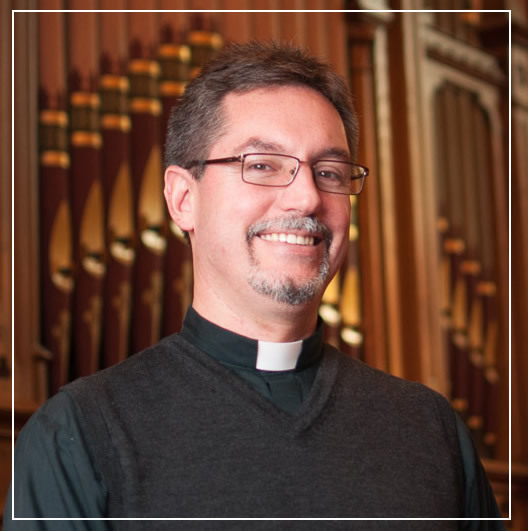 He currently serves as Incumbent of Collingwood, and sits on the York-Simcoe Area Council, the Diocesan Council, and the Diocesan Executive Board. He holds an Honours degree in Theology and a Masters degree in Ethics, and remains committed to a ministry of teaching, pastoral care, outreach and social justice inspired by Jesus simple truth: that we really can aspire to love the Lord our God with all our heart, mind, soul and strength; and our neighbour as ourself, in a way that is Good News for the world.